You know how I’m always picking on myself for not taking very good pictures because I AM AN AWESOME PHOTOGRAPHER!!!? 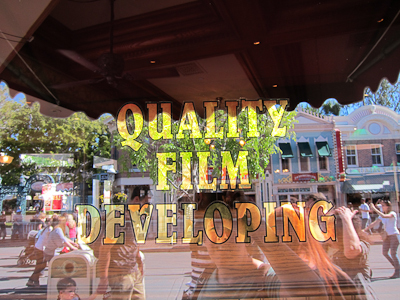 Well, Disneyland has an answer to that. 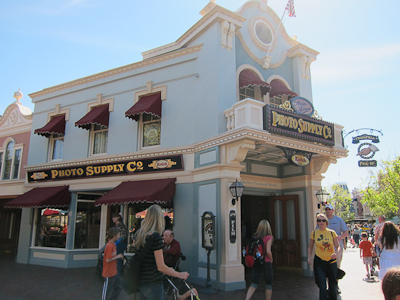 Up at the end of Main Street on the corner is the Photo Supply Co. store. This is prime real estate, my friends. 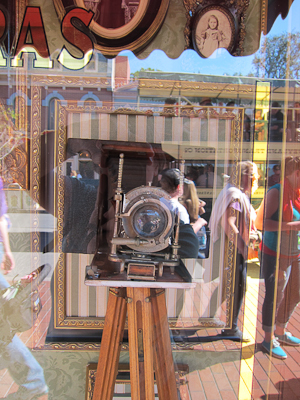 Once upon a time, the camera store at Disneyland was hoppin’. You could buy all kinds of stuff for your very own camera. Everything from 35 mm film to those flashbulbs that came in a cube and like totally exploded in order to make the flash, leaving me with a latent childhood fear of flashbulbs bursting past that plastic cover thing shooting hundreds of tiny little flashbulb shards into my eyes, totally blinding me and quite possibly entering my brain, killing me as well. Anyway, Disneyland doesn’t sell those anymore. Which is like totally the same thing, right? 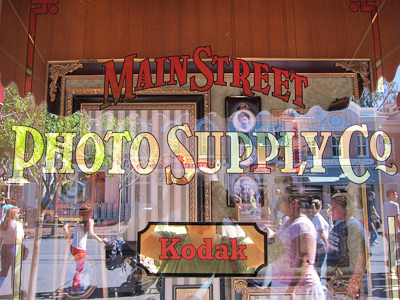 In keeping with the oldey-timey theme of Main Street, the Photo Supply Co. has cool window displays. I want to say that the whole mirror-type groovy effect with the crowd moving by and my arms holding the camera is some kind of artistic choice to bring out the true experience of Disneyland, which is both reflective and transparent, coupled with the new and the old, brought together in a montage of gilded definition, but actually I’m just not a very good photographer. There is cool stuff in the actual window. What kind of camera is that? I’m not sure. 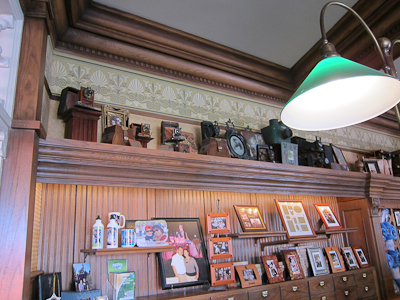 The rest is all devoted to PhotoPass. What is PhotoPass, you ask? Or didn’t ask? 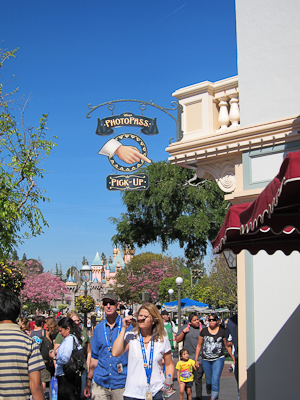 PhotoPass is Disney’s in-park photography system. There are PhotoPass photographers stationed strategically throughout the parks (in front of the castle, for example, or by the flower Mickey at the entrance). They will take your picture and scan a card with a code. Interestingly, the new Annual Passes have a PhotoPass code on them, so if you’re an AP holder you no longer have to worry about carrying around a PhotoPass card! If you’re not an Annual Passholder, then you will have to worry about carrying around a PhotoPass card. But here’s the cool part. 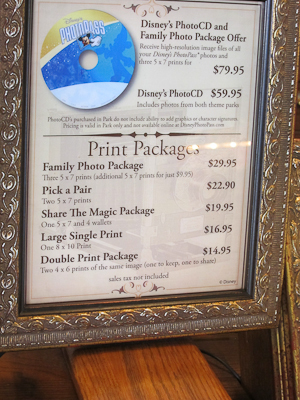 You can actually go around collecting PhotoPass pictures throughout your whole vacation and then you can buy a CD of ALL of your PP pictures, called the Disney PhotoCD. And that’s cool because then you can get them printed anywhere. And you can go online and add cute little borders and stuff. It’s actually a pretty good deal, especially because it means the whole family gets to be in the picture. And you know how I feel about that. You can also had the PP photographer your own camera and they will take a picture for you. 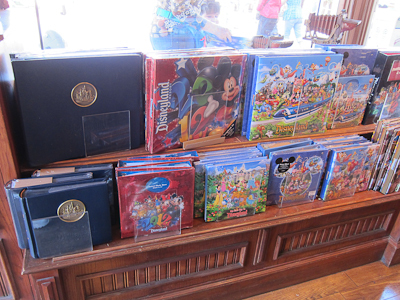 To translate, the Disney PhotoCD is $59.95. The prices on the bottom are for prints of various sizes. The package at the top is the PhotoCD and three 5×7 prints. 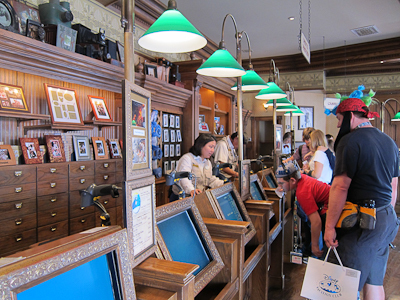 You can also buy “Disney’s Photo Gallery CD.” What’s that, you ask? Or didn’t ask? Well, it’s a collection of professional photos taken around the parks including rides, attractions, characters, and so on. What’s really cool about that is that you know how you spent all that time trying to get the perfect shot of the facade of Small World but your camera is kind of lame or whatever, and you never get the angle right? With the Photo Gallery CD, you don’t have to do that anymore! Because the picture has already been taken for you! And not that I wish to speak poorly about your photography skills, but chances are it’s a better picture than the one you would have taken! Which goes back to my whole “put the camera down” thing. There’s no point in trying to that perfect picture of the Haunted Mansion to add to your scrapbook later, because that picture has already been taken. So put your camera down and enjoy the park. The Photo Gallery CD is $39.95. So swing by the Photo Supply Co. for all of your photo needs, or most of them anyway. I’m with you on “put the camera down,” but my husband is disappointed when I don’t turn up with any pictures. (He’s a terrible photographer, so I’m the one charged with taking pictures.) Several years ago we were in Prague in February during an unusual cold snap, not quite as bad as the one they’re having this winter but cold nonetheless. He wanted pictures. I wanted to come home with all my fingers. 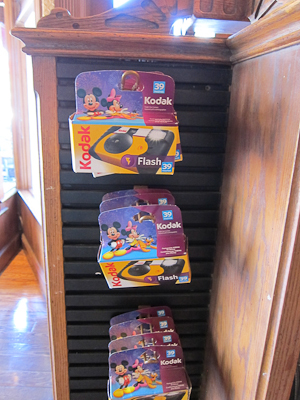 The cool thing is the PhotoPass system is linked with the system at Walt Disney World. My girlfriend and I took a two week vacation there and had tons of PhotoPass pics and our own pictures (She’s a Cast Member and her main gate pass has a PhotoPass barcode on it. Nifty!) and when we got back we decided to get a bunch of PhotoPass pictures at Disneyland of some areas we don’t have many pictures of. We were able to get both our pictures and the WDW pictures on one Photo CD. Plus she still had the 50% holiday cast discount at the time, so it was a no brainer.